For Oct. we will be making baskets at Jan Green’s home on Halloween, October 31st, from 10 til whatever. Bring a lunch if you like, and whatever you are working on. There are lots of materials if you would like to get started. Showcase this month is special — many of the works displayed by members will be in the Show and Sale, November 12-13, 2016. Look for them at the sale! October brings to mind watching falling leaves and leafing through books as the cooler weather comes and I am inside more. 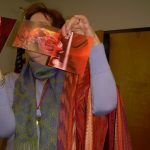 For our program speaker Randi Pankhurst, a fiber artist who works in paper, she might be designing the leaves of her next art book. I hope you will find inspiration to apply to your own art form in the OWG October 21st program. Randi Parkhurst is a book artist and arts instructor, living and working from her home/studio in Olympia, Washington. Calling all felters or those who would like to learn come to Gail Trotter’s home and “Rock On” , making foam felted rocks for the ANWG booth, October 26th at 1 pm. Bring tools for needle felting or wet felting we can do either. If someone could bring a glue gun we can make different size rocks We have donations of fleece and some foam. If you have some special color prepared fleece you like, please bring. RSVP or for more information contact Gail at getrotter@comcast.net.